After examinations, consultations and maybe a few hesitations, you have finally confirmed your dental appointment for your new ceramic crown, onlay or veneer. You’ll be pleased to know that the hard part is now behind you. The procedure itself will be a breeze, thanks to our one-visit CEREC® dental system. We’re excited to announce our CEREC® system. It involves an amazing new capability that allows you to be in and out of our office in just one visit instead of the two or three you would typically have to endure in order to complete your restoration. Come in and experience our CEREC® technology today, and ask how it can make your next ceramic restoration easy, effective and attractive! 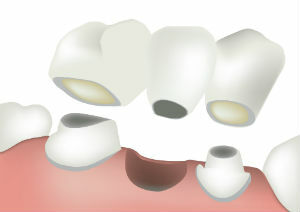 Dental bridges typically take 2-3 weeks to complete and are less invasive than other options, such as dental implants.